This is similar to – but much spicier than – the adobo marinated skirt steak I posted last week. The chipotles give this a great, smoky heat. As a result, a Mexican beer or three go much better than red wine with this. Open the can of chipotles and place entire contents into a food processor. Process until smooth. 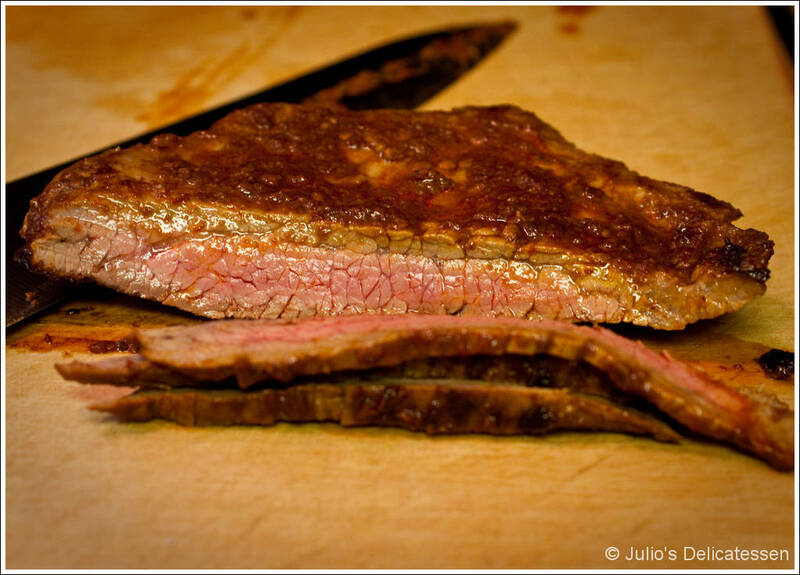 Smear flank steak with a healthy portion of the marinade. (Place any leftover marinade in the fridge for up to a month). Allow to sit for 30 minutes or so (at room temperature). Set oven to “warm” or lowest setting. Heat oil in a large cast iron skillet. Cook white onions until brown – about 5 minutes. Place in an oven-safe container and set in oven. Leave as much oil as possible in the pan. Heat skillet back to medium high. Cook meat (and all the marinade along with it) for about 5 min per side. Allow to rest (on counter or in the barely-warm oven) for 10 minutes. Cut WITH the grain to make two or three pieces of equal width, then slice each of those across the grain into ¼ inch wide strips. Serve the tortillas with the beef and onions and allow people to make their own tacos.